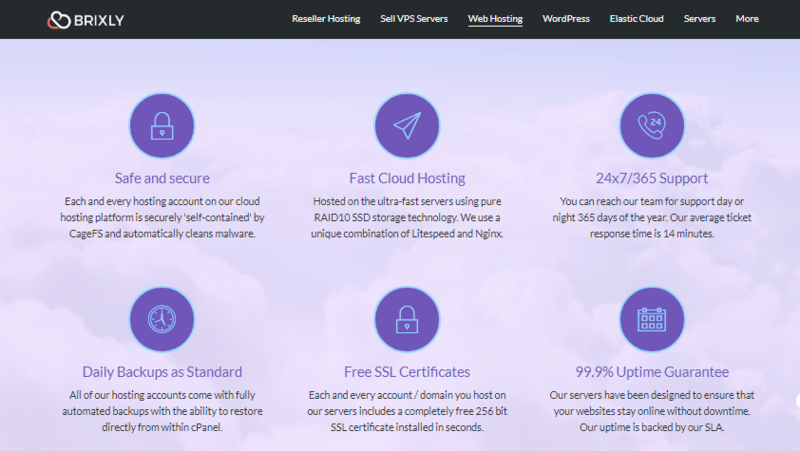 Brixly Review 2019: Is Brixly a Good Hosting? Brixly offers low-cost and fast performance hosting with enhanced security. However, there’s no free domain registration. In business for more than six years, Brixly provides hosting solutions using servers located in the United Kingdom and the United States. With unlimited web hosting, powerful virtual and dedicated servers, and its latest innovation — the Elastic Cloud — the company continues to deliver flexible solutions to SMBs and enterprises. The website is in English only. Along with the daily automatic backups, customers can create backups at any time they desire from their account. They can also restore the full website backup or particular files, email account, and DNS records in one click from their cPanel at any time. The servers use pure RAID 10 SSD, which is known to be ultra-fast. It also provides full-page caching with Redis, which you can either allow or disallow on your website. It stores pages in memory for faster delivery. Also, it uses a combination of Litespeed and Nginx, and that accelerates the delivery of content and PHP speed. Litespeed also provides a bit of DDoS protection through bandwidth and connection throttling when the server detects a DDoS attempt. Brixly adds more security with CageFS, placing each account in its space, therefore, limiting the effect of security and bandwidth usage issues on one account to others. If you wish to use WordPress, then Brixly might be for you. Its web hosting plans are optimized for WordPress, allowing you to install the web application, clone, and preview your WordPress website in one click. There’s also a managed WordPress solution that offers this and more, including hourly backups, one-click staging, and plugin management. Both users of the shared hosting and managed WordPress hosting are given access to a free website builder with over 200 designs that fit more than 30 business types. If you’re going for VPS, but are not sure of the exact traffic/space you’ll need, the Elastic Cloud solution might be the perfect replacement. It operates in a VPS cloud-like environment that allows vertical and horizontal scaling as your need increases. Also, you wouldn’t be dependent on only one data center because your files are stored in cluster servers across multiple centers. Brixly’s prices are low cost for the features on offer. There is also a 30-day trial for as low as the price of low-end hosting to enable you to test the services at a reduced cost and less risk. Plus, there’s a 60-day money-back guarantee on shared hosting, and a 30-day money-back guarantee on Elastic hosting. Brixly customer service is impressive. You can contact them through live chat, support ticket, email, and phone. I used the live chat and was connected to a real person immediately. It also has a learning center (knowledge base) with helpful articles and videos that you can use to find answers on your own. Brixly offers innovative and low-cost hosting solutions, but it seems more focused on its reseller services. Wondering how Brixly stacks up against other Web Hosting companies? Enter any other Web Hosting company and we will give you a side-by-side comparison.